Volume 1 completely SOLD OUT!!! 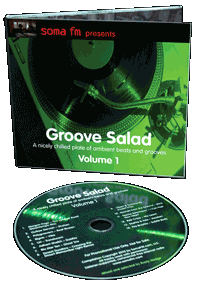 We're excited to announce our new compilation CD: Groove Salad Volume 1: A collection of some the most popular and classic tracks played on Groove Salad. Mostly instrumental, the tracks are a cross-section of the music you'll hear on Groove Salad: Downtempo, ambient groove, trip-hop, chillout and worldbeat. 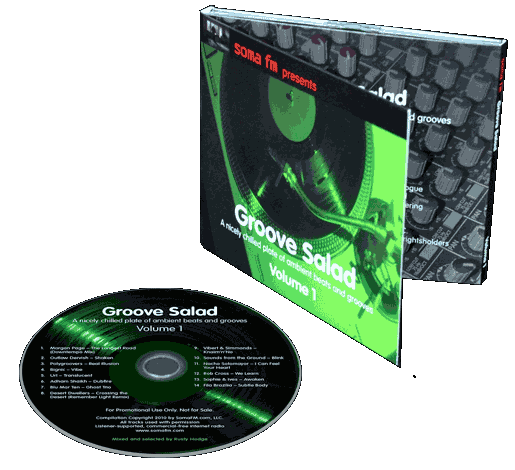 If you're a fan of Groove Salad you're going to love this CD. Selected and mixed by Rusty Hodge and mastered by Jake Perrine at RFI/CD. Get your copy of this great CD with your one-time $40 support donation. For $75, get both a SomaFM Tshirt and the CD. We'll include a couple SomaFM stickers as well.